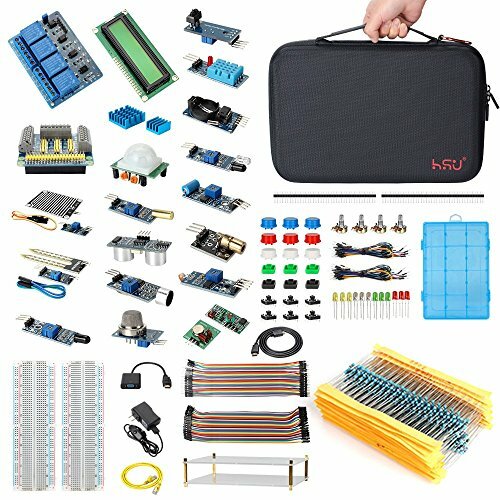 This is a Ultimate Upgrated Kit for Raspberry Pi and Arduino. It is more comprehensive than other Raspberry Pi Kits in the market,it contains more than 300 kinds of different electronic components for electronic hobbyist and also Raspberry Pi fans. BEST CHOICE-The highest cost performance kit for electronic hobbyist and advanced learners to expand Raspberry Pi and Arduino programming. COMPREHENSIVE KIT-More than 300pcs components with breadboard kit and 16 sensor models,this is the most complete kit for Raspberry Pi and Arduino in the market. EASY CARRYING-With a durable large size protective carrying case,you can hold on all accessories inside,easy for carrying. CONTINUOUS IMPROVEMENT-Additional accessories kit are added,thicker pins resistor instead of normal resistor,LCD module come with soldered pin,all this change from thousands feedback from customers. Noted:Raspberry Pi Model and Recommended Micro SD Card is not included.Feel free to contact us if you have any question. If you have any questions about this product by HSU, contact us by completing and submitting the form below. If you are looking for a specif part number, please include it with your message.